We lost power in the wee hours of the morning on January 10th in Guatemala, just across the border with Mexico. The transmission made a terrible screeching noise, so John put it in neutral. When he put it back in forward, there was no forward thrust. With no wind we bobbed around with our mainsail flopping, drifting with the current—which was, fortunately, generally the direction we wanted to go. Coincidently, the boat we were traveling with, Casteele, also lost power. They, however, were able to make the needed repairs to restart their engine and continue on to Costa Rica in the morning. So what did we do? 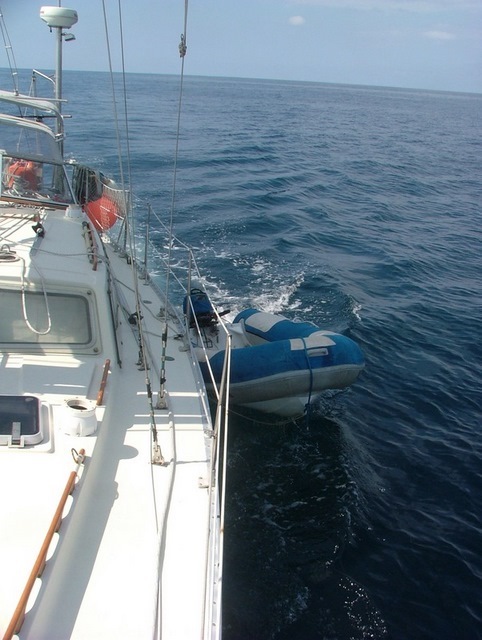 We tied the dinghy to the side of the boat and used it to power us. (Boy, are we glad we have our super-dinghy with the 25 hp outboard that we bought from Julia!) Puerto Quetzal was more than 60 miles from us at that point. In the afternoon the wind came up, and we were hopeful that we'd have wind enough to get us to Barillas. After five hours of good sailing, though, we were becalmed again. John climbed in the dinghy, filled the tank, and we set off again about 6:30 pm. That tank lasted until two in the morning. We did the math, and without wind we didn't have enough gas to reach Barillas. We were due south of Puerto Quetzal and could see the lights, so we hove to, set our radar alarms, and tried to sleep. A border patrol plane kept me awake the rest of the night (it was my watch) because it triggered the alarm every time it came within six miles of us. It patrolled in circles that brought it within range of us periodically for at least three hours. After I stopped the alarm each time, I'd go out and shine a flashlight on our sail to make us more recognizable as the harmless sailboat we are. Since I was up anyway, I spent some of the time between alarms pulling together the Spanish sentences I would need to contact the capitanía de puerto (port captain). In case no English speaker was available, I wanted to be able to tell them who we were, that we needed help, and where we were. When the time came, I managed, but between the radio static and my feeble Spanish, it took awhile. Finally, a voice told us in English that they were sending a patrol boat to tow us into port. When the capitanía came to the boat later to clear us in, we discovered that he was the one who spoke English. His staff had had to call him to the radio to talk with us. The boat that towed us in said "coast guard," but we suspect that "navy" and "coast guard" are close to the same thing here. They seem to be used interchangeably. There was one person on board who spoke excellent English. When he came to see us at the dock later, his uniform and the boat he arrived in both said "navy." He wanted to apologize that he couldn't help us more. What he was talking about is what happened when they got us into the harbor and dropped the tow line. A fairly strong wind had come up, and we started to drift. The officer told us that a small boat was on its way to help us anchor. Meanwhile, we were drifting rather quickly toward the shore. Finally, John put us in reverse and powered us back-until a line that had fallen into the water from the dinghy fouled our prop. John quickly cut that line and jumped into the dinghy to tow us away from the concrete pier that we were then drifting to. Finally a sport fishing boat came out from the marina with a line to tow us, not to the anchorage but to the dock at the marina. We had almost drifted into it anyway, but since we thought we were going to anchor, we had neither dock lines nor fenders ready. It was quite a fire drill, and our port side did hit the dock unprotected. Fortunately, there was little damage. After that things improved rapidly. We had lots of help from boat hands from neighboring sport fishers in getting tied to the dock. One young man (Johnny) was eager to practice his English and helped us communicate with the marina security and dock attendant. Then he went out and brought us a mechanic who had been working on another boat. The marina manager organized bringing the capitanía and aduena (customs official) to the boat to clear us in. Now we're settled at Marina Pez Vela (Sail Fish Marina), an expensive marina with few services. The people here on the dock and at the restaurant are great, but there isn't much here. The transmission has been pulled and examined and definitely needs to be replaced. We'll be ordering the replacement from British Marine in Oakland tomorrow. No one knows how long it will take to get it here and through customs. While we're waiting, we hope to make a side trip to Antigua; it's said to be beautiful. Although we didn't really want to stop here, we'll make the best of it, and we'll enjoy meeting the other cruisers here—both northbound and southbound—while we wait.